*Grada de animación/Animation Stand: members (except Benjamines) can purchase 1 ticket at the price of 20 € through the virtual office. The ticket will be nominative and non-transferable, so it can only be used by the member who holds the card. ID and membership card will be required with the ticket at turnstiles. Tickets purchased are non refundable and exchanges are not allowed. Atlético de Madrid is not liable for tickets purchased by unofficial channels. Child members have a 50% discount on the general price tickets for them. The purchase of tickets through any authorized channel implies acceptance of the Club policy. As reflected in Royal Decree 203/2010, every spectator must carry a ticket or a season ticket. Therefore, even babies and children from 0 years old must have a ticket or ID to be able to access the match. Tickets purchased are non refundable and exchanges are not allowed. Atlético de Madrid is not liable for tickets purchased by unofficial channels. Members have no discounts when buying seats in these areas of the stadium. 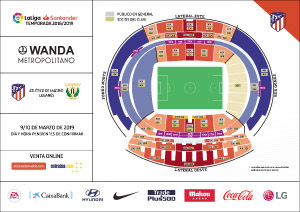 Wanda Metropolitano Ticket Office: Monday-Friday from 9 a.m.- 7 p.m and Saturday-Sunday 11 a.m.- 7p.m. On the day of the match starting at 10 a.m.
Gran Vía Official Store: Monday to Thursday from 10:00h to 21:30h, Friday and Saturday from 10:00h to 22:00h and Sunday from 11:00h to 20:00h.